The powerful FIREHOUSE Software package uses an integrated database and graphical user interface so data is entered one time, even when used in different areas of the system. FIREHOUSE Software is intuitive and easy to use without computer training. While NFIRS 5.0 certification and NEMSIS Gold Certification are a core component, our clients worldwide rely on our commitment to providing valuable, versatile, and fully integrated solutions. FIREHOUSE Software is dedicated to helping agencies manage business, day-to-day operations & planning, field operations & decision support, communications, and technical challenges. Experience FIREHOUSE Software, and you’ll experience software, support, and services unmatched in the industry. FH Enterprise – for stand-alone workstations, local and wide area networks, and departments requiring remote access to a central database. What’s the FH Enterprise difference? 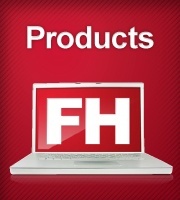 FH Web – for a central database and easy access from anywhere using a Web browser. What’s the FH Web difference? Each system includes advanced features for departments to tailor FIREHOUSE Software to their needs. Additional features to expand FH capabilities for the department can be added on to fit a customer’s needs.